Fr. Louie Vitale OFM at Livermore Labs, August 6. Photo by Jim Stevens/Bay Area News Group. People gathered on the sidewalk in front of the main driveway to the King of Prussia, Pennsylvania complex of Lockheed Martin on August 6, where they held signs next to large banners held by stakes planted in the ground. The underlying message of the day centered around the killing and slaughter of children, from Hiroshima and Nagasaki to U.S. drones strikes in Pakistan and Yemen, and Israel’s slaughter of innocents in Gaza enabled by Lockheed Martin, the world’s #1 war profiteer and weapons supplier. Next to large wooden sign with the Lockheed Martin logo and “we’re making a killing” which for years has accompanied demonstrations at Lockheed Martin, we put up A Memorial to the Innocents lined with a child’s stuffed animals and pictures of the Hiroshima Child. A bell tolled for the victims and Tom Mullian shared two of his latest songs. Then came our litany and ceremony of remembrance and peace with water and sunflower seeds, signs of peace, flung against the large Lockheed Martin sign at the driveway entrance. Seven people immediately crossed the property line to offer a prayerful plea for the children. Intending on walking to the main lobby entrance, they were immediately stopped by Lockheed Martin security backed up by Upper Merion police and police cruisers blocking the drive. The activists were arrested, cuffed and taken to the police station where they were cited for disorderly conduct and released. The seven are: Paul Sheldon, Media, PA, Theresa Camerota, Wyncote, PA; Jeff Costello, Runnemede, NJ; Rev. David Reppert, Conshohocken, PA; Tom Mullian, Cheltenham, PA, Father Patrick Sieber, OSF and Robert M. Smith, both of Philadelphia. 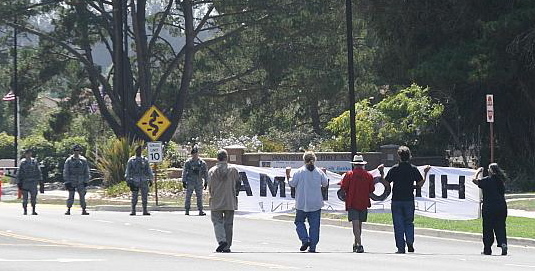 On August 9, the 69th anniversary of the atomic bombing of Nagasaki, 30 Catholic Workers and friends held a vigil and nonviolent direct action at Vandenberg Air Force Base on California’s central coast. Five people were arrested after blocking the entrance road to the base with a large banner which read “Hiroshima Never Again”. Mike Wisniewski, Karan Benton, Jeff Dietrich, Mark Kelso and Fr. 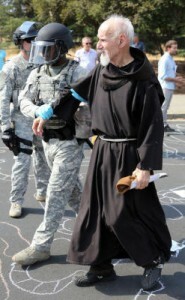 Steve Kelly, S.J. were cited for trespassing and released an hour and a half later at Vandenberg Village. A court date is pending. To commemorate the 69th year since the U.S. began the Nuclear Age by dropping an atomic bomb on Hiroshima, seventeen friends (including 6 month old baby Eli and 2 1/2 year old Stephanie) from the Atlantic Life Community and other peace groups participated on August 6 in a noon-time silent peace witness at the Pentagon that was organized by the Jonah House Community and the Dorothy Day Catholic Worker. Carrying signs, photos of the aftermath of the Hiroshima bombing and banners, two of which read “Remember the Past, Repent the Sin, Reclaim the Future–Hiroshima and Nagasaki” and “Abolish Nuclear Weapons,” the group processed from Army-Navy Drive to the regular protest area near the Pentagon metro station. Instead of going into the police designated protest zone which is situated behind a fence, the group initially remained on the sidewalk. After a police warning that everyone move into the designated area or face arrest, most complied. However, Liz McAlister, Kathy Boylan and Eric Martin continued to remain on the sidewalk for about fifteen minutes. After giving three warnings to comply with the order or face arrest, Pentagon police placed the three under arrest and they were taken to the Pentagon police processing center. They were charged with “disobeying a lawful order” and after being processed were released. They will be tried on October 17 in U.S. District Court in Alexandria, Virginia. LIVERMORE — Sixty-nine years after the massive devastation of the atomic bombings of Hiroshima and Nagasaki in 1945, there were 60 seconds of silence at 8:15 a.m. Wednesday, August 6 to commemorate the moment when the first bomb was dropped. 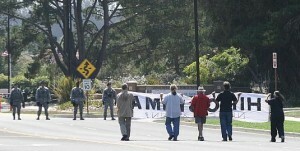 This year’s anniversary protest outside the Lawrence Livermore Laboratory bore the theme “Failure to Disarm.” It was marked by lawsuits, filed in April by the tiny Republic of the Marshall Islands against nine nuclear weapons states, including the United States. The lawsuits do not seek damages relating to the 67 nuclear weapons tests the U.S. conducted in the Marshall Islands between 1946 and 1958. Instead, the “Nuclear Zero” lawsuits, filed in The Hague and against the U.S. in federal court in San Francisco, claim the nine states failed to disarm as prescribed by the Nuclear Non-Proliferation Treaty and by customary international law. The San Francisco complaint specifically cites the Livermore lab’s activities to modernize the U.S. nuclear weapons stockpile as a breach of the treaty and a violation of international law. Before the moment of silence, approximately 100 peace activists gathered outside the lab to hear keynote speeches and rally to the music of Duamuxa and Daniel Zwickel, the son of longtime peace advocates Abe and Jean Zwickel. Alameda County sheriff’s officers arrested, cited and later released about 30 people for trespassing. Specifically concerned about the lab’s formal budget request to Congress that earmarks 89 percent of the lab’s fiscal year funds for activities related to nuclear weapons, Kelley said the issue isn’t whether or not society should have scientists, it is what they should be creating. Tri-Valley CAREs staff attorney Scott Yundt monitors the lab’s activities and facilitates a support group for the 1,900 former lab employees who have filed for compensation because of job-related illnesses. Yundt attended his 10th protest this year and said he hoped a group campout in Del Valle Regional Park on Tuesday would help prompt him to recommit himself to action. Planning to take his wife and two young children to join the roughly 30 people he said typically attend the nighttime vigil, Yundt expressed his hope that ongoing protests will result in future change. Bob Hanson, of Rossmoor, said he planned to attend the protest because he’s angry at his country. 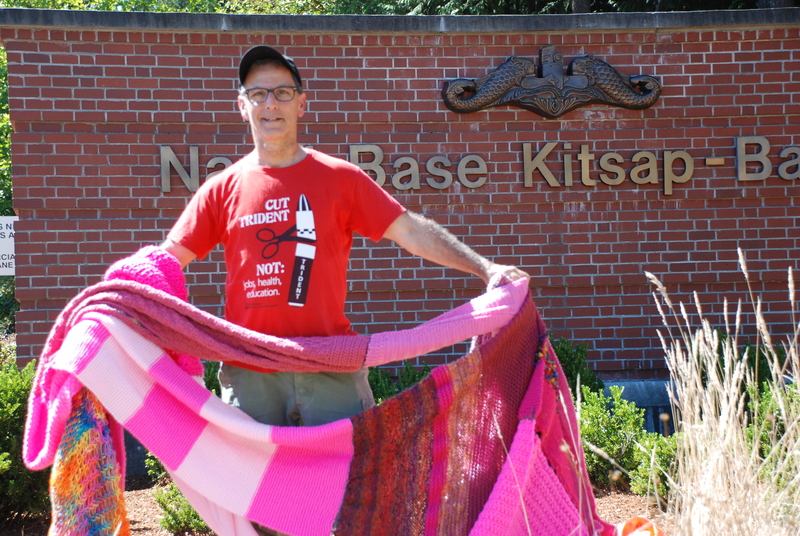 Silverdale, WA, August 9, 2014: Peace activists rolled out a 60-foot-long scarf at a West coast nuclear weapons base in a demonstration against the Trident nuclear weapons system on the anniversary of the atomic bombing of Nagasaki. The Trident submarine base at Naval Base Kitsap-Bangor, just 20 miles from Seattle, Washington, represents the largest concentration of operational nuclear weapons in the U.S. arsenal. Each of the 8 OHIO class submarines at Bangor carry as many as 24 Trident II (D-5) missiles, each capable of carrying up to 8 independently targetable warheads. Each nuclear warhead has an explosive yield up to 32 times the yield of the bomb that destroyed Hiroshima. At Saturday’s demonstration, people lined the roadside at the Bangor main gate with signs and banners calling for the abolition of nuclear weapons. Participants also unveiled huge photos of the devastation caused by the Nagasaki bombing. Local singer/songwriter Jim Page sang a number of anti-war songs, including one his best known songs, Hiroshima Nagasaki Russian Roulette. When Page finished his concert, five participants walked on to the base entrance lanes of Highway 3/Luoto Road carrying the scarf. An additional participant, a Buddhist monk, entered the roadway drumming and chanting. Washington State Patrol troopers removed all six protesters and the scarf from the roadway. They were cited on the scene for being on the roadway illegally, and released. Those cited were David Brice, Port Orchard, WA; Mack Johnson, Silverdale, WA; Doug Milholland, Port Townsend, WA; Elizabeth Murray, Bellingham, Wa; Gilberto Perez, Bainbridge Island, WA; and Dylse (Rick) Turner, Seattle, WA. 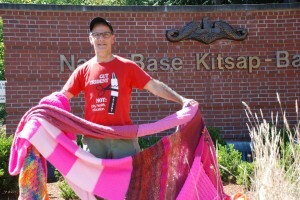 The wool scarf was composed of pieces knitted by people from around the United States and assembled into a single scarf in an action known as Wool against Weapons. Wool against Weapons began in the United Kingdom as a statement against the Trident nuclear weapons system deployed by the British government. Activists there held an action on August 9thstretching a seven mile-long scarf between their Atomic Weapons Establishments. Following the return of the arrestees, the demonstrators were led in peace songs by folk singer John Palmes, who wrote The Atombomb Song. Palmes is from Juneau, Alaska. Sunday’s vigil and nonviolent direct action were the culmination of a two-day event at Ground Zero Center for Nonviolent Action called MUSIC NOT M.A.D.NESS. It focused on the power of music to bring people together in common cause, and included a concert by Bainbridge Island group Chele’s Kitchen. Ground Zero has been working to stop the Navy’s construction of a $715 million Second Explosives Handling Wharf at Bangor. The case is currently in the 9th Circuit Court of Appeals; the opening brief was filed on June 18th. Ground Zero is also engaged in a campaign to defund the Navy’s next generation ballistic missile submarine. Known officially as the OHIO Class Replacement or SSBN(X), the project, in addition to the estimated $100 billion in construction, will cost taxpayers hundreds of millions over its lifecycle. Ground Zero will be working to build awareness among legislators in Washington, D.C. regarding the reasons for defunding New Trident in coming months. For thirty-seven years Ground Zero has engaged in education, training in nonviolence, community building, resistance against Trident, and action toward a world without nuclear weapons.